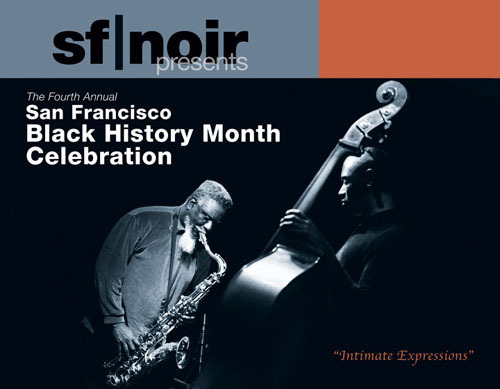 The 4th Annual San Francisco Black History Month Celebration presents “Intimate Expressions”, a unique opportunity to get up close and personal with the artists in this year’s festival. The Marcus Shelby Jazz Orchestra with Emmy Award-winning actor Peter Macon, performing ‘Midtown Sunset’ based on the paintings of famed Harlem Renaissance painter Romare Bearden as told through the poetry of Langston Hughes. The Irrationals, a journey through America’s music with the intimate, witty and award-winning The Irrationals. A soulful a cappella ensemble known for their rich, complex vocal style. The delicious blending of their voices has been described as “café _mocha for the ears”. Ise Lyfe. With two national poetry slam competitions under his belt and opening for artists from Dead Prez to Ben Harper, we’ll experience why this Oakland native is one of the nations premier poets. Co-presented with Zeum and the San Francisco Black Film Festival, a fun-filled afternoon of programming for the family including creative learning activities taking place at Zeum, spoken word and film screenings at the Metreon. Caille Millner, Harvard graduate and co-author of The Promise: How One Woman Made Good on Her Extraordinary Pact to Send a Classroom of 1st Graders to College. Caille Millner provides a short reading and offers a glimpse into this powerfully inspiring story of Oral Lee Brown who, in 1987, on a $45,000 salary, made a pact to a group of 1st graders to pay for their college education. Twelve-year-old Eric (Isaiah Matthew) is sent by his mother to pick up his grandmother’s medication. With his granny’s prescription, insurance card and $22 stuffed in his sock, Eric starts on what appears to be a simple errand. Along the way, things become unexpectedly complicated as he finds himself contending with the thoughtless demands that adults make of children and his friends’ risky behavior. As night falls, Eric struggles with his sense of responsibility and takes actions that seem logical to a good kid on the threshold of adulthood, but will in fact bring him to the brink of danger. Meanwhile his mother waits, worrying and questioning her decision to send Eric alone into the city streets. This refreshingly realistic depiction of urban youth, from the very talented storyteller, Aaron Greer, neither talks down to its audience nor sensationalizes its subject. The situations and characters speak for themselves. Winner of numerous Independent Film Awards. SLAMMIN’ is a fresh mix of a cappella singing, beat boxing and body music. Always unplugged and unleashed, this ferociously talented ensemble skillfully reveals how the body can amaze us in the most musical of ways. SLAMMIN’ brings down the house with lightning-fast improvisation, electrifying harmonies, and raucous humor. Deeply rooted in the grooves of Jazz, Funk, R&B and World Music, SLAMMIN’ pushes a cappella music outside the box, and over the ledge. Zoe Ellis. Her dramatic and colorful voice is well known to Bay Area and overseas music fans. Critics describe her as “a resourceful and inventive vocalist”, and praise her ability to “[keep] the crowd involved with her presence and between-song patter.” Audiences find her performances riveting. Experience her tonight as Zoe also pays a nod to Nina Simone. Aya De Leon, from appearing on HBO’s Def Poetry, receiving a Goldie Award in Spoken Word from the SF Bay Guardian, being named the best theater discovery by the SF Chronicle to sharing the stage with Eve Ensler, the Roots, and co-authoring the book “How to Get Stupid White Men Out of Office”, Aya is a gem in the Bay Area arts scene and thrills us tonight with her brand of spoken word. This entry was posted on Monday, February 7th, 2005 at 10:00 am. It is filed under Special Feature. You can follow any responses to this entry through the RSS 2.0 feed.